Genbox Family History version 3.6.4, a Windows genealogy application, is out and available for download. This is a fairly large update (see the release notes linked below for the full list) and is a free update for current users. 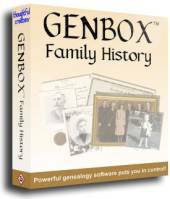 Genbox Family History has been updated to version 3.6.2. Genbox is a Windows genealogy applications that offers you all the tools, with all the power and flexibility, that you have been wishing for in a genealogy program. Charts, reports, search, media, full sourcing capabilities, and much more..
– Dutch (Netherlands), German, Danish, and Polish translations updated. – The “results” of the most recent report are now written to the special activity list “Report Results”. For narrative reports, this is a list of the main entry individuals. For custom reports, this is a list of the main entries after filtering. * This version contains improvements to data entry, templates, estimated dates, and charts. * The Database Selection Dialog offers easier startup options, including access to a “sample” database. * Translations for Slovenian have been added, and translations have been updated for Danish, German, and Polish. * A large number of problems have also been corrected. You can download the udpate from Genbox’s download page.